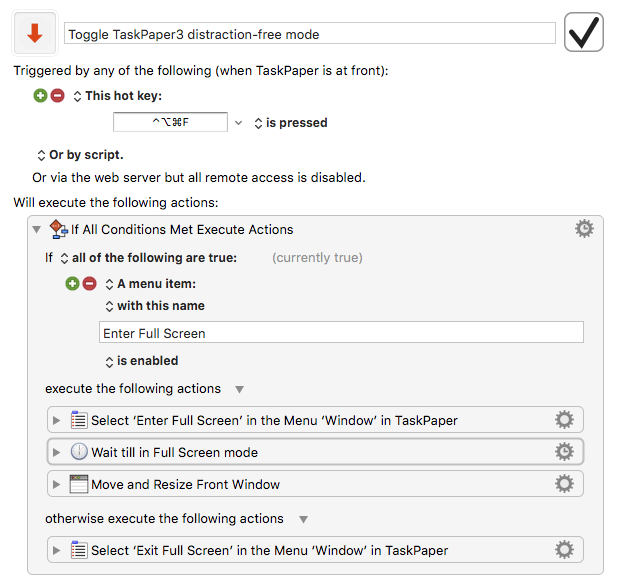 I would use a full screen/distraction free mode in TaskPaper where the app comes forward on a black background. Anyone else like this idea? Certainly a good idea. Arguably already there, though perhaps you have a swifter and simpler toggle in mind ? Oddly, this is grayed-out for me. 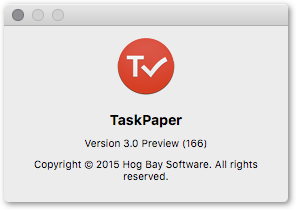 I am writing about a view where TaskPaper moves forward on the screen on a black background similar to writing apps. 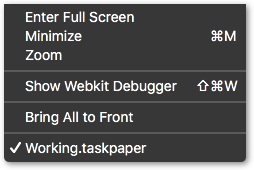 Fullscreen works fine for me on 10.11.2. One improvement (for me at least) would be a preference to set a maximum width for the text that is displayed when in fullscreen mode. I tend to use fullscreen mode with the active area reduced to a central (1/3) column of the screen. This sounds like a great solution. I don’t have Keyboard Maestro yet, but maybe I can accomplish the same thing through a theme setting. I will look into it.